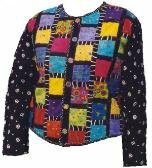 The Hopscotch Jacket combines quick and easy piecing on the jacket front using fat quarters of cotton or flannel to make a fast and fabulous jacket you'll love to wear! Using the Pop Top Jacket garment pattern, it's dart-free, fits like a dream, and features a flattering curved hemline. Pattern includes all sizes XS-XXL, 4 to 26.This pattern uses the same garment base as The Pop Top Jacket. KIT includes pattern, 6 handmade buttons and cotton fabrics in colors similar to those pictured for the outer shell of the jacket. It does not include notions or lining. 6 handmade buttons in bright colors also available.